The Penn Scale CM-101 digital price computing scale provides retailers with a low cost choice in today's world of high price legal for trade digital scales. The CM-101 is NTEP Approved "Legal for Trade" and is pretty easy to master for everyday use. You can sell your strawberries, fudge or anything you desire based on weight to your customers at the market or stand. 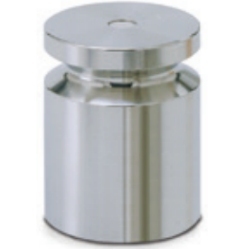 The capacity is 30 x 0.01 pounds which is pretty standard in the weighing industry for this type of scale. The scale operates either on 120 VAC power or with the rechargeable battery. This Penn Scale CM-101 computing scale is one of the lowest cost brand new NTEP legal for trade price computing scale that we know of. The CM-101 is a popular 30 lb NTEP Certified Legal for Trade Price Computing scale. It has a well-earned reputation of providing years of easy and reliable use for customers. The CM101 is very simple to use and is the perfect size and weight. The scale comes with a backlight LCD display, a long lasting internal rechargeable battery and an AC adapter. The scale also comes with a one year warranty. It is very popular in locations such as supermarkets, delicatessens, candy stores, ice cream shops, frozen yogurt stores, coffee and tea retailers, farmers markets and other retail food establishments where owners need to charge patrons by the pound. In this example, you type in the tomato cost is $0.50/lb. 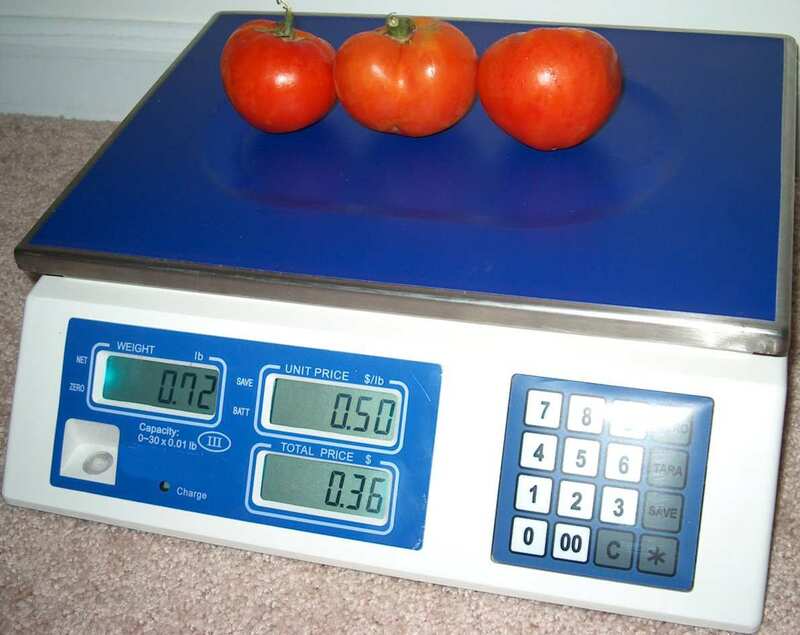 The 3 tomatoes on the scale actually weigh 0.72 lb. The scale computes the price per pound for you! So, you charge your customer $0.36 for this transaction. In this example, the operator types in tomato cost is $0.50/lb. 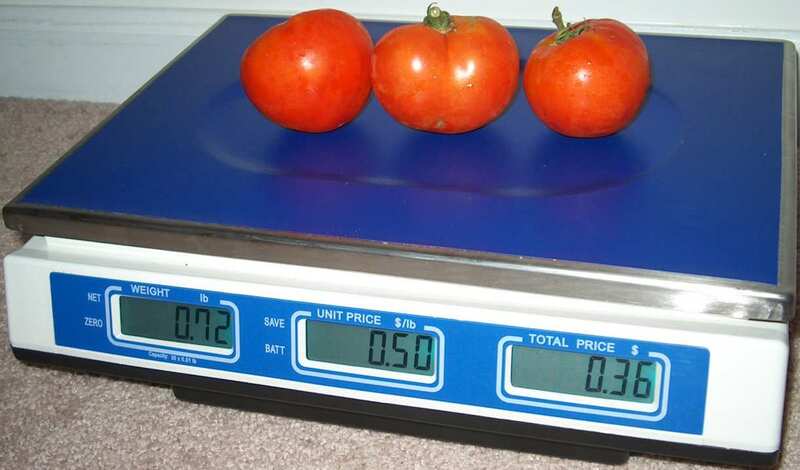 The 3 tomatoes on the scale actually weigh 0.72 lb. The scale computes the price per pound for you! So you charge your customer $0.36 for this transaction.